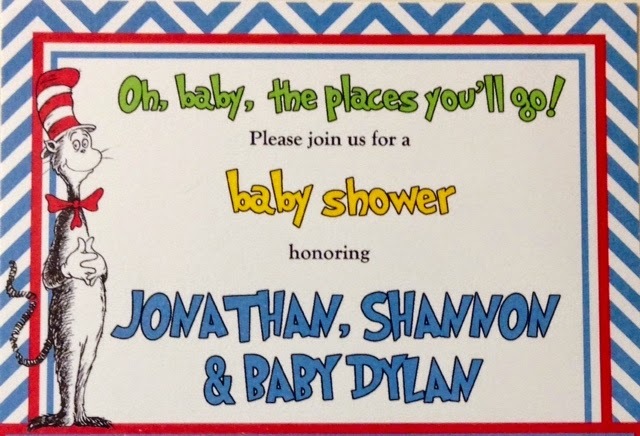 On April 25, a group of our close friends through us a baby shower to welcome Dylan. 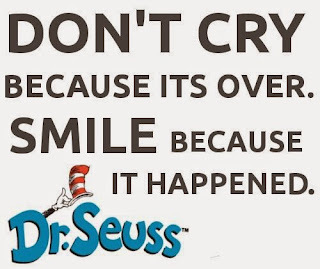 It was an absolutely perfect day, all set in the theme of Dr. Seuss. 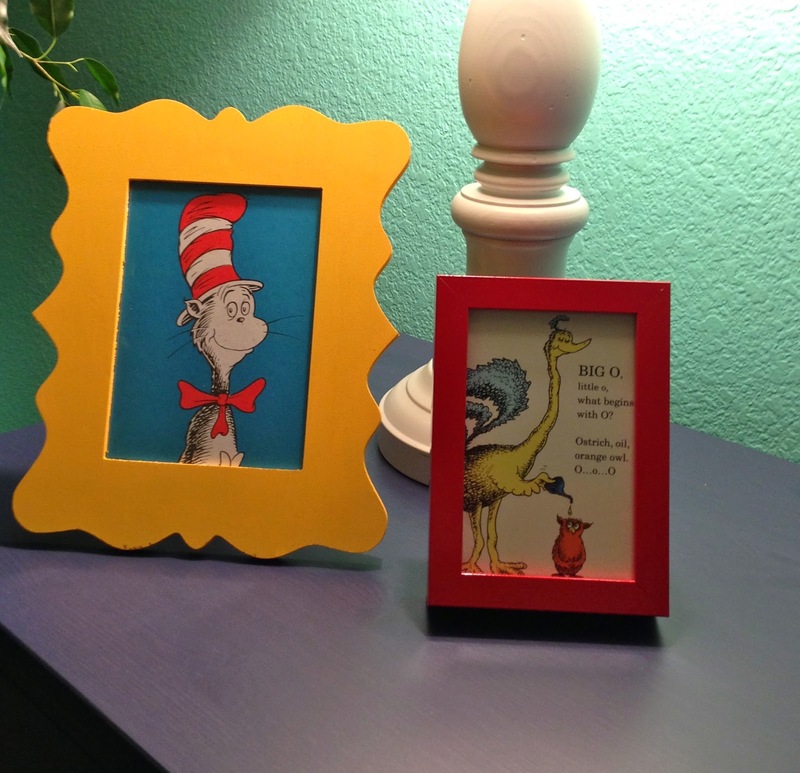 Dylan's nursery is decorated in Dr. Seuss, so it was so fitting that we celebrate Seuss style. Our friends did such an amazing job, and it was everything we dreamed of. Our closest friends from Southern California, Margaret and Adrian came up for the day and that meant the world to us! Jonathan and I kept pinching ourselves to make sure it was really happening. A baby shower for our son! As most anyone knows, California is in an awful drought, and we haven't had a good rain in months. But, wouldn't you know it...it rained all the night before and the morning of the shower. The shower was held in our friend, Lorilei's backyard. Luckily, the clouds parted, the sun shined, and the day could not have been more spectacular. Our adorable cat in the hat was an angel! He was passed from person, to person, and barely fussed (unless he was hungry or needed changed.) He even donned a cat in hat out outfit for the occasion. 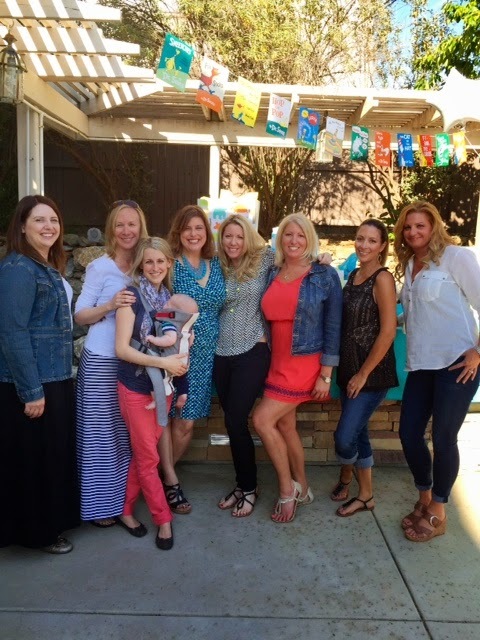 We cannot thank our friends enough for ALL their planning, coordinating, and assembly of our baby shower. It's a day that will remain in our memory forever and it wouldn't have been possible without them! You gals are the best and we love you! Laura did most of our decorations...amazing! Dear Little Who, We Have Waited for You! 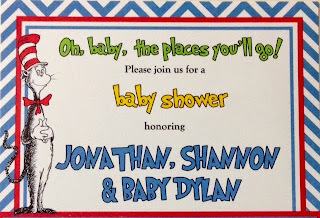 Personalized m-n-m's with Dylan's name! Lots of delicious homemade food! How can it be that you've been in this world a month already? On one hand, it doesn't seem possible, and on the other, seems like you've always been with us. I guess in a way, you've have. You were born on Thursday, March 5 at 3:59pm at Bronson Hospital in Kalamazoo, Michigan. Becca was able to have you naturally, and that made her and us very happy! 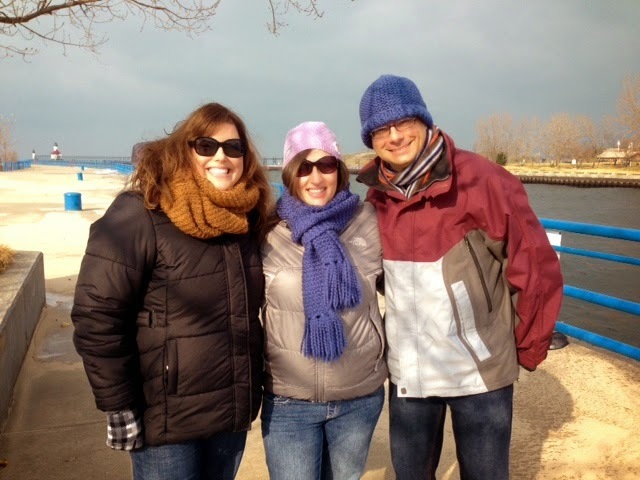 I flew out to Michigan on Tuesday, March 3 because Becca slipped on some ice and was having trouble walking. I am so glad I went out to you guys, because she could hardly get around on her own. I flew into Chicago and drove to Saint Joseph, and within 10 minutes of being at her house, we were in route to Bronson. There was no way she was going to be able to walk around the next few days, so we needed to get her help. On my way to meet you! Upon return to the hospital the next morning, the doctor saw the excruciating pain Becca was in, and decided to admit her and let you come naturally. I immediately got on the phone to your Daddy and said it was time for him to come! He'd just gotten to work, so he turned around and went home. He flew out of Sacramento at 7:15pm that night and arrived in Kalamazoo (luckily they have an airport that was 15 minutes from the hospital) at 9:30am on Thursday morning. We were so thrilled he made it on time. Becca was still not in active labor, so we stopped for a Biggby coffee (Mommy became obsessed with them while we were there) and a bagel. Your Daddy was worried that we were going to miss your birth, but I knew we had some time. While we were gone, they broke Becca's water in hopes of coaxing you out, but you didn't budge. 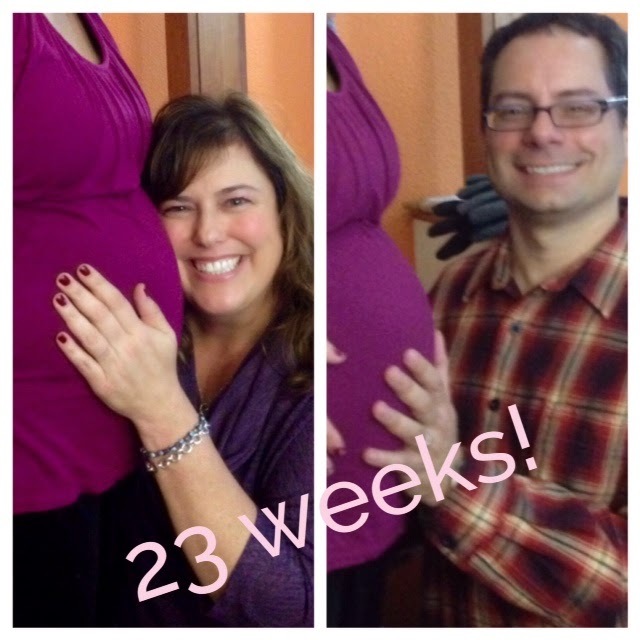 Not long after we got back to the hospital, they gave her Pitocin, a drug that induces labor. And boy, did that get things going! Her contractions started becoming stronger and more often. It was really hard to see Becca in so much pain, but she was truly brave. As she progressed, they gave her an epidural. I stayed in the room with her and we will never forget the doctor who administered it. He was a crotchety older man, who kept looking at the television while getting the shot ready! We laugh about it now, but we both wanted to punch him at the time. Not too long after that, one of the nurses came in to see how far Becca was dilated and said it was time!!! I started crying, because I could not believe how close we were to meeting you. The midwife came in and Becca started pushing. After a couple pushes, one of the nurses came over and asked if I would like to deliver my son! I was beyond shocked and took my place by the midwife. We saw your little head peeking out a couple times, and after a big push, your head came out! The midwife told me to grab your head and pull you. Well, not wanting to hurt you, I gingerly tugged on your tiny head. And she told me, "You're going to have to pull a lot harder than that!" I gave a big pull and out you came!! It was a moment I will never forget. 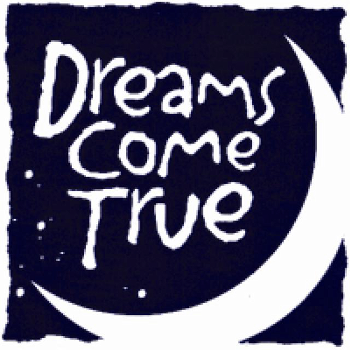 It was like a dream. I held you up and knew right away that you were just perfect. The midwife waited a few minutes and then told Daddy it was time to cut your umbilical cord. Daddy placed my hand on his, and we cut it together. Immediately after that, they placed you directly on my chest (I had a hospital gown on) and I just held you. I could feel your heart beat and I remember crying and telling you how long we've been waiting for you. After a short time, they took us across the hall to have some private time with you. The nurse weighed and measured you; 7 pounds, 15.5 ounces and 20.5 inches long. Your Daddy had some skin-to-skin time with you after that. Soon, the Doctor came in and took your vitals. You were deemed totally healthy. Another nurse came in and she let us help give you your first bath. We were able to stay in a room with you at the hospital. 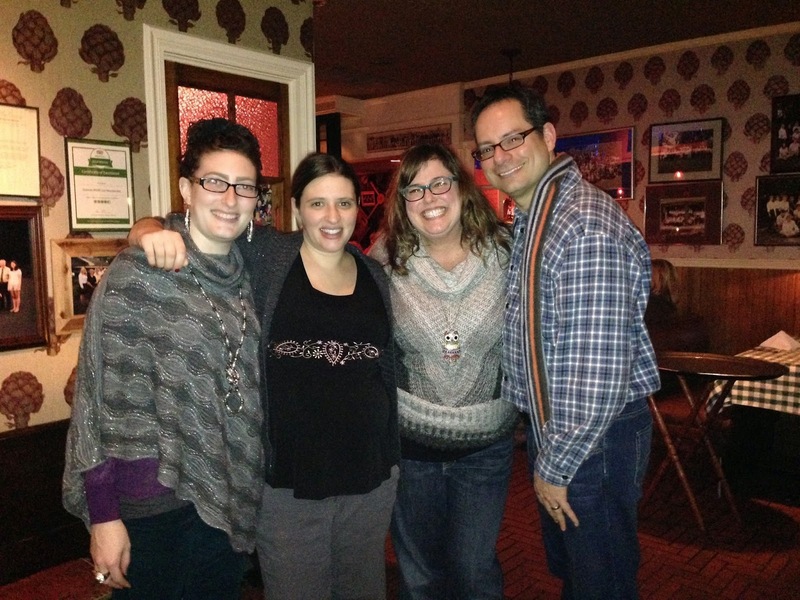 The staff at Bronson were amazing and took such good care of all of us. I remember after we were settled in our room, Daddy went to the car to get our bags, and I just held you and took this selfie. I will remember this moment as long as I live. My heart was so full and for the first time in a long time, I felt completely at peace. Welcome to the world. Welcome home! 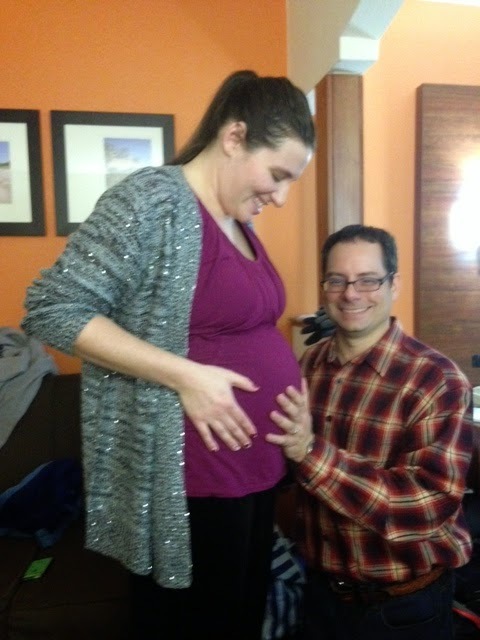 We are on the FINAL countdown to meeting our son! We are so full of excitement and nerves. So many feelings that can't even be described...Our main concern right now is making sure we get to Michigan before he's born. It's so hard to know when he'll come. Becca is hanging in there; very uncomfortable and anxious for his birth. It's amazing to see how big she gets each week! She's 39 weeks today and at her appointment this morning, is about 2 cm dilated. If he doesn't come naturally this week, they will deliver him via c-section on Monday, March 9th. We are packing everything we can ahead of time. Instead of one hospital bag, we have four suitcases, two carry-on's, a car seat, and of course, Miss Petunia Picklebottom. Baby boy's suitcase is the first thing we packed. 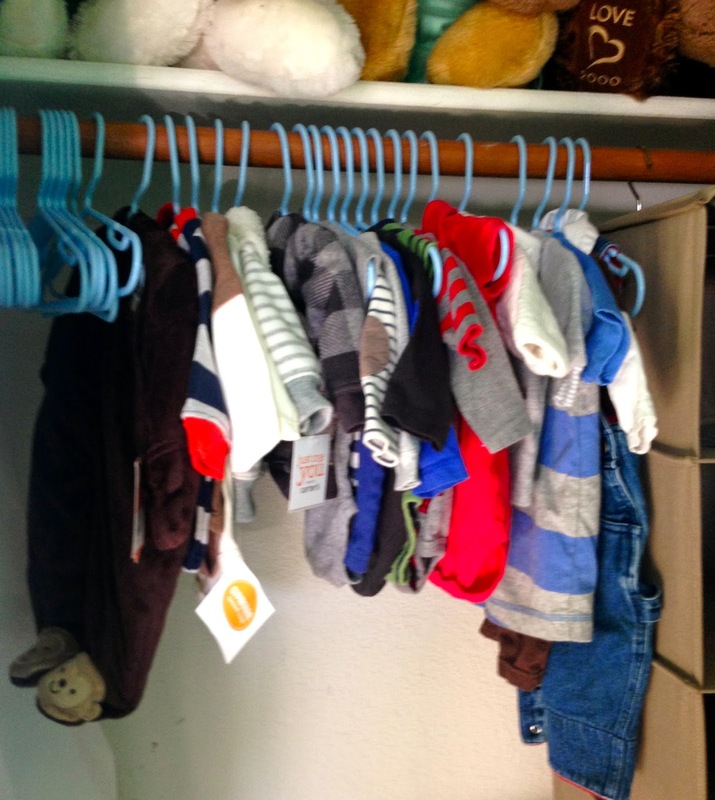 It was a very special time for us and it felt surreal to fold and pack his tiny clothes. I'm sure he has way more than he'll need, but he has so many cute clothes to wear! As I've mentioned before, due to Michigan adoption laws, we have to stay in the county the adoption is filed for approximately two weeks. The two weeks start 48 hours after his birth. So, we will be making Novi (pounced Knov-eye, I've learned) our home for the couple weeks after he's born. J will telecommute for a good part of that time, so he doesn't have to use all his vacation. Baby boy's nursery is coming together quite nicely. We actually got a lot more done than we thought we would. It's so amazing to go sit in his room and imagine that soon, we'll be rocking our son in the glider. His smaller size clothes are on their little blue hangers, and his bassinet is ready to welcome him when he gets home. Our good friend, Laura gave us her daughter's crib. We just picked it up and assembled it yesterday. Very cool fact - it's the same crib designer/model I had when I was born (except mine was yellow.) Yes, they had cribs back then. While we have a lot of final touches to do on his nursery, here is a tiny sneak peak of the theme we chose. We are so close! We wait for the phone to ring. Given the distance, we are hoping and praying we make it back in time to be there when he's born. We'll do everything in our power to get there. Wow! Is it really true that we are finally going to be a mommy and daddy? Pinch me. We have wanted this for so long. We have wished for nothing more and we couldn't feel more blessed in our relationship with Becca. We are going to have a son. We are going to have a family. In the blogging world, when mama's are pregnant, they do bumpdates; just a quick update on how their pregnancy is going. 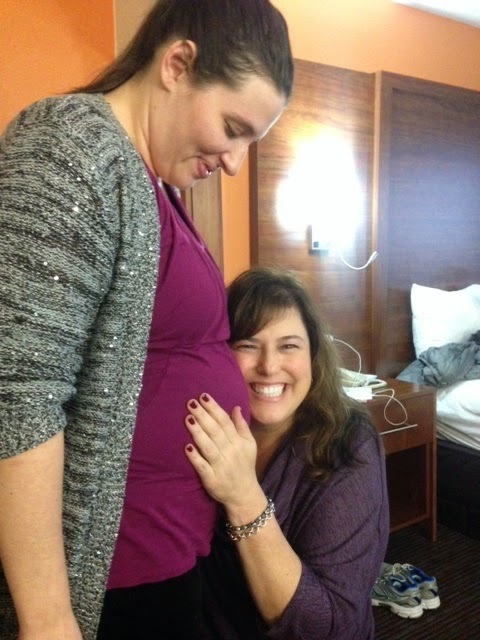 So, even though I'm not pregnant, it's just as important for me to do one...it's just coming from Becca! Baby boy was 36 weeks yesterday. Can you even believe it? I know Becca can. 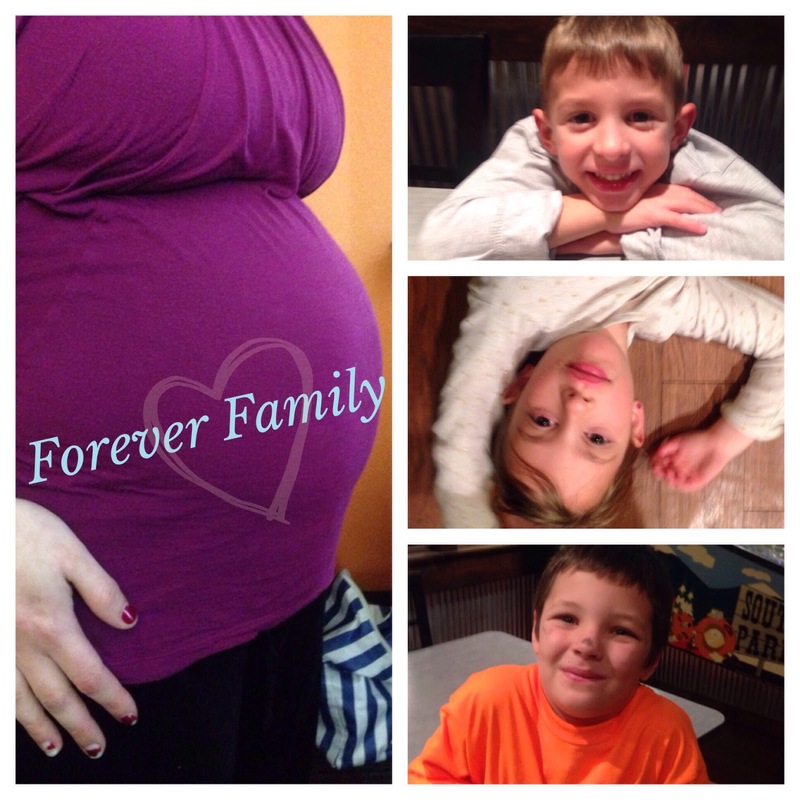 For us, these pregnancy has been a breeze and we can't believe how fast time is flying! 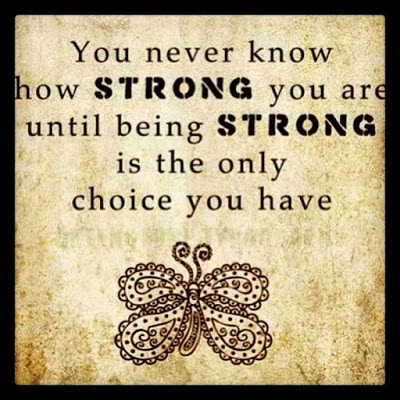 But for Becca, I know it's not easy, and she is such a strong woman. 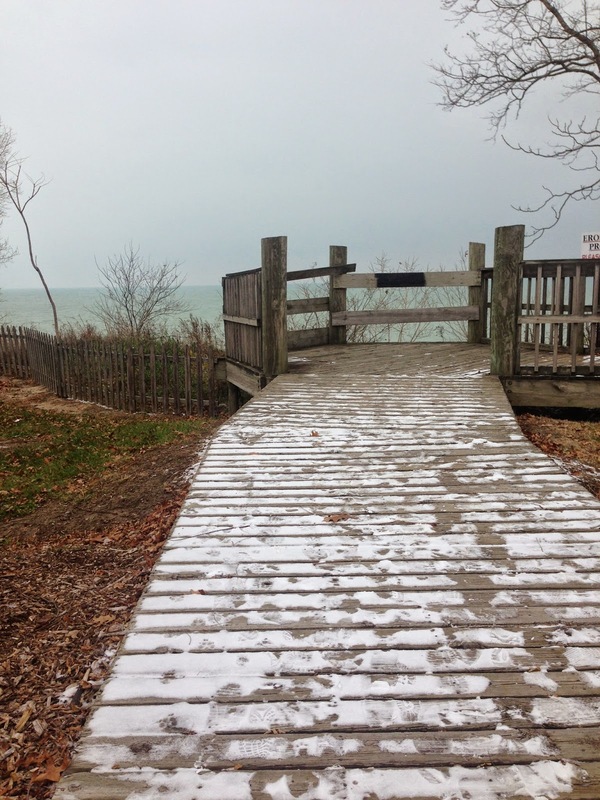 Besides all the normal pregnancy symptoms, Becca has to deal with the Michigan winter. Just today, she drove in a whiteout and often, has to shovel her driveway, just to get out of her house! I've had to shovel snow before and it was hard enough not being nine months pregnant. Our respect and awe for her runs very deep. She is just truly amazing and may not even realize what an inspiration she is. Baby's Size: 36 weeks. Baby boy is about the size of a head of lettuce, or honeydew melon. He weighs approximately six pounds, and is roughly 18 1/2 inches long! Sleep: Quote from Becca, "What sleep?" She has a hard time finding a comfortable position and gets up constantly to go to the bathroom. Overall Feeling: Very tired and anxious. Food Cravings/Aversions: Becca has a huge sweet tooth right now, and she normally doesn't. Maybe she's channeling me? She's loving bananas and cannot stand eggs, which is unusual, because normally, she LOVES them. Symptoms: Becca suffers from bad acid reflux and and headaches. She has a great trick for acid reflux though...take a couple shots of balsamic vinegar. Who knew?? She can't wear her contacts anymore and often gets bad joint and ligament pain. Most Looking Forward to (after birth): Being able to lift her foot high enough to flush public toilets with her foot. It's the little things, right? 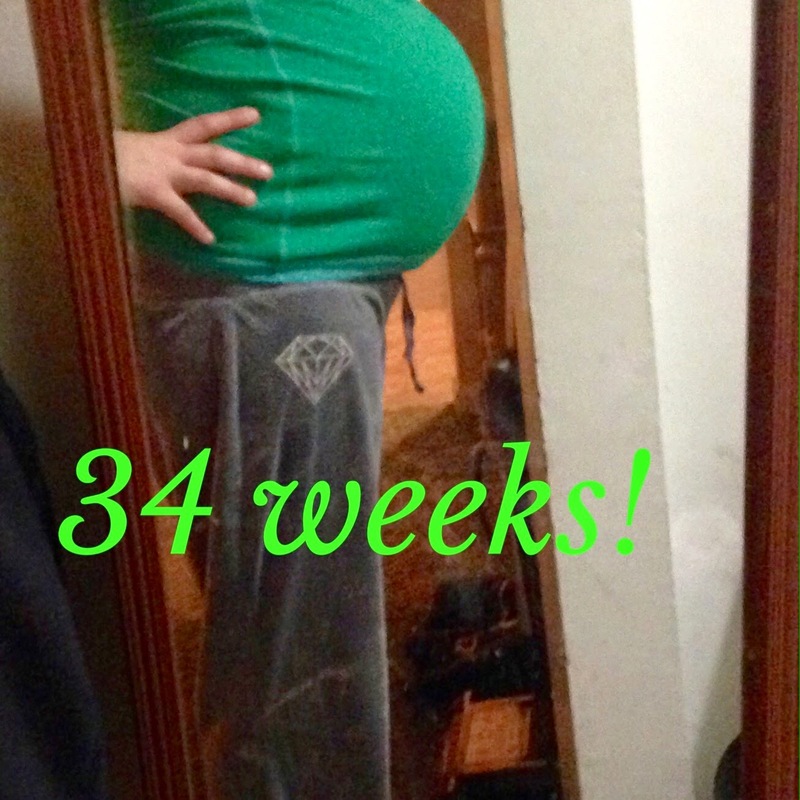 This Pregnancy Compared to Others: She hasn't gained as much weight this time, and experienced no morning sickness. Huge plus! Guess on Baby Boy's Birthdate and Size: February 26. Seven pounds and 21.5 inches long. Awww Moment: Her kids love to kiss baby boy on her belly and talk to him. 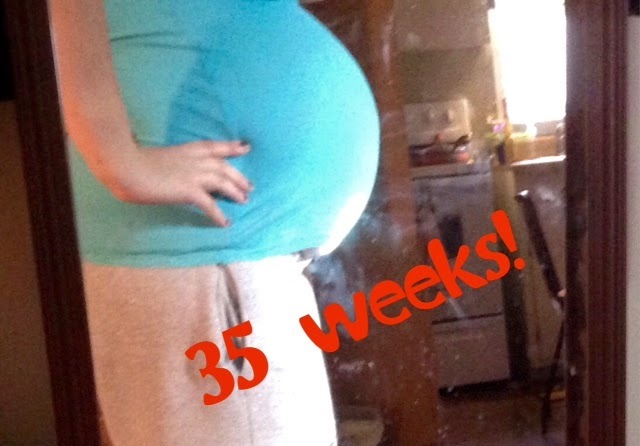 Fun 36 Week Fact: At the end of this week, baby boy will be considered early term. He's getting closer to being able to breathe on his own and his skin is getting smooth, and his gums are rigid. His kidney's and liver are in working order and circulation and immune system are almost fully developed! Needless to say, J and I are so excited for his arrival! We are also so looking forward to seeing Becca and her kids again. We will keep you posted on his progress. Please keep Becca in your thoughts and for a safe and healthy delivery. Below are some photos that show just how much he has grown. He's so handsome and getting to be such a big boy! Happy New Year! It's so hard to believe the holidays are over. J and I stayed close to home over the holidays and spent them with family and friends. Baby Boy is happy and growing big in Becca's tummy. 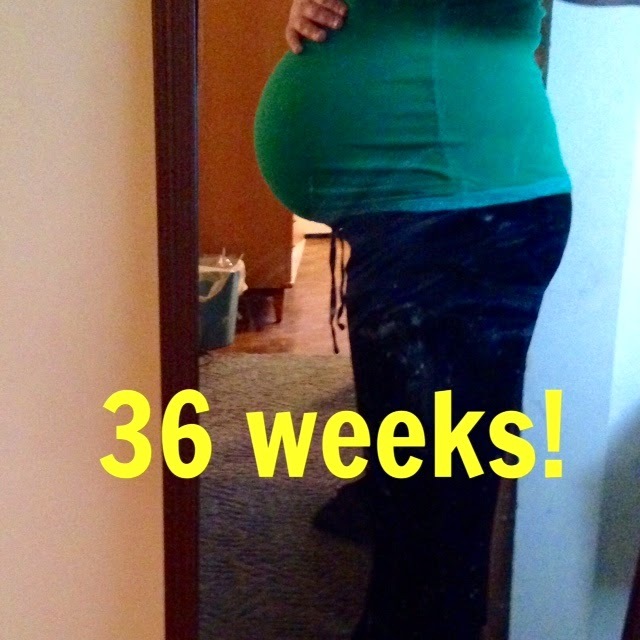 Becca is almost 32 weeks! He is about the size of a honeydew melon. He's been very active lately, unfortunately, kicking Becca a lot in her rib cage. She is such a trooper though. We FaceTime with her and the kids occasionally and our relationship with them is truly flourishing. They are already such a big part of our lives. J and I are slowly getting things ready for baby boy. With adoption, you have to be careful not to buy too much ahead of time. Because it's never 100%, our agency advises us to be prudent in our before-baby buying. It is getting very hard! Have you seen ALL the cute baby stuff? Fortunately, we have some great friends with kids, and we have almost a bin full of 0-3 month clothes from them. J and I look at the tiny clothes often and just cannot believe how close we are to meeting our little man. It's also time to buy our plane tickets and book our hotel. 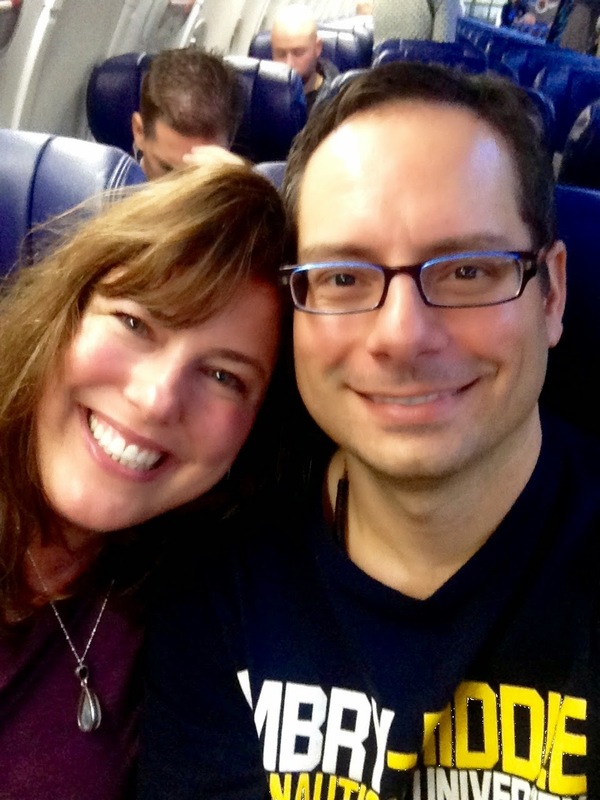 We are likely going with Southwest, since they don't charge astronomical ticket change fees. We have no idea when we're going/coming home, so our flights and hotel have to be very flexible. All in all, things are going very well. It's very scary at times, wondering if this is really going to happen, if we are truly so close to meeting OUR son. Becca has been so great and I think we are blessed to have forged an honest and open relationship early on. I know this is going to be very hard for her, and I wish there was something I/we could do to lessen her grief. But, as I've told her many times, this is just the start to a new beautiful family. Her and her kids are baby boy's family forever. 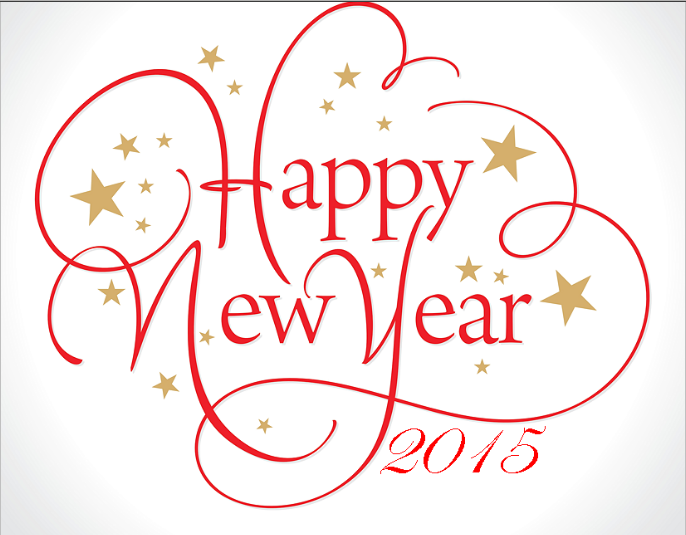 Wishing you and yours a wondrous New Year! 2015 is the year of our baby. The year we will finally become parents. 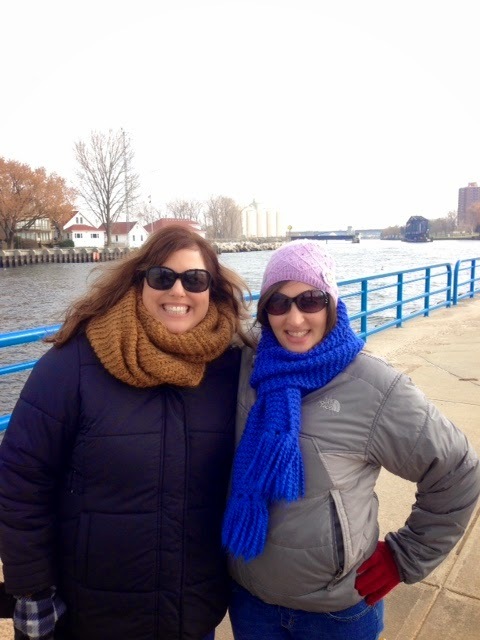 We are excited to share some of our photos from our trip to Michigan last week. 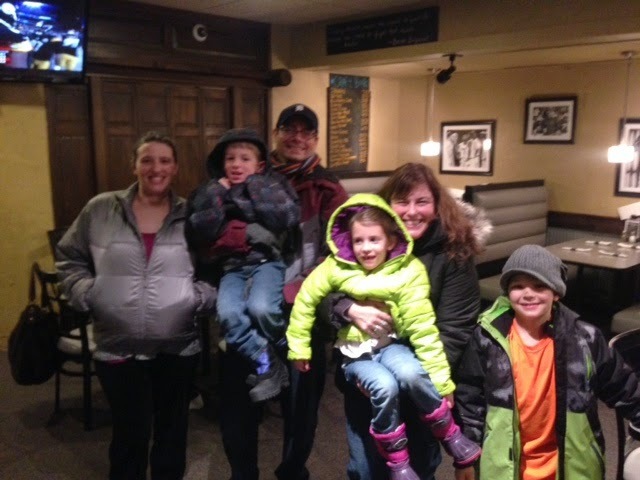 J and I went to meet Becca, our birthmom, and her three amazing children. I don't think any of us knew what to expect, but we had the best time together. We count our blessings everyday that we were matched with this wonderful family and cannot wait to grow our families together through open adoption. 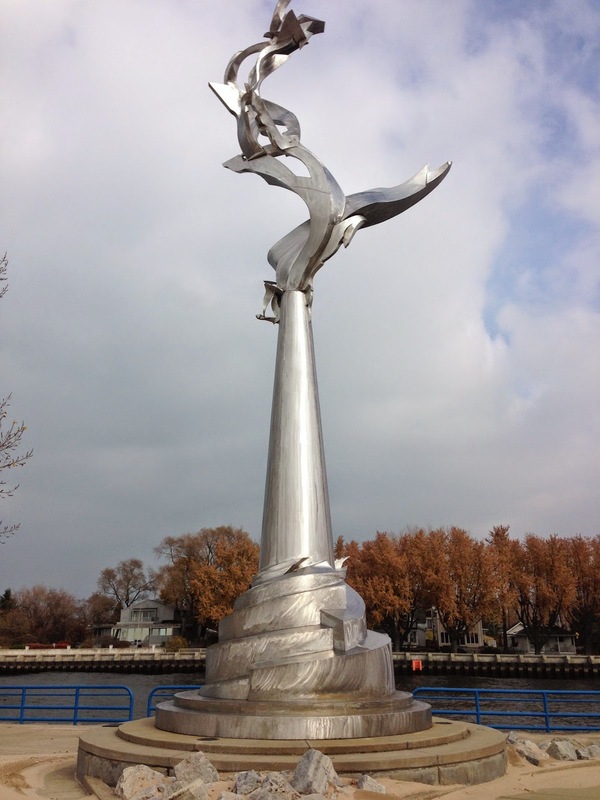 We flew into Grand Rapids, Michigan and Becca lives about 1.5 hours away in a picturesque little lake town, St. Joseph. St. Joe is called the Riviera of the Midwest, and while it may not have the warm weather of the Riviera, it's pristine sand and beaches, put you right in a vacation mood. 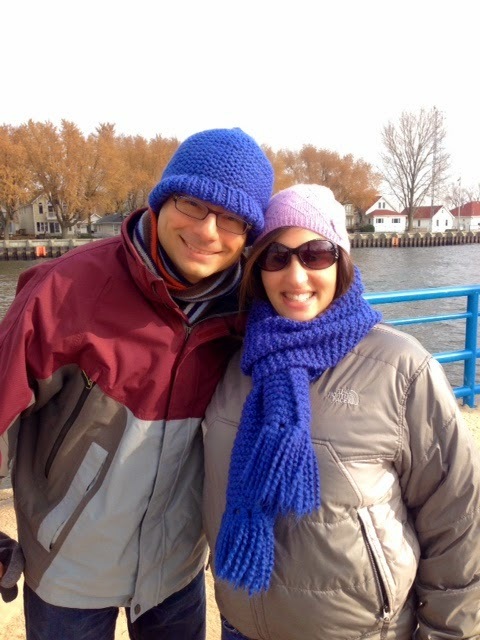 On our first day together, Becca showed us the beaches, lighthouse, and quaint stores in St. Joe. 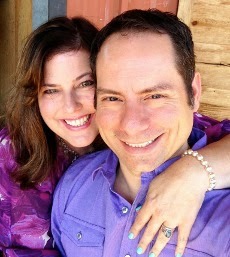 We had fun shopping together and had a great lunch at Clementines. Turns out, Becca loves to share food, and for those that know me, know I do too! Although I don't like fish, I tried her lake perch and it wasn't bad. Kind of tasted like fried chicken! Us with our amazing birthmom!! We were lucky to meet her sister that night for dinner, and the four of us had an incredible dinner and relaxing conversation. For dinner, Becca chose Grand Mere Inn and it was the best meal we've had in a long time. True Midwestern fare, lots of good steak and potatoes! Let's just say, we didn't go hungry on this trip. On Sunday, we went shopping with Becca for her oldest son, Eli. Eli was a cheetah in the school play on Monday night and he was supposed to wear orange shirt and orange pants. Yes, you read that right! Orange pants? Needless to say, he wore an orange shirt and brown pants, but he fit in just fine. On Sunday's food journey, Becca brought us to a Mexican store/restaurant (my very favorite food!) La Perla was a little dive, and as true Mexican food aficionados know, they serve the best food. We got to meet Eli after lunch and spent about an hour with just him and Becca at their house, before her twins, Emily and Evan came home. We had so much fun playing computer games with Eli, and just playing and chatting with the three of them. The plan was to go for pizza for dinner, but before that, we took them swimming to our hotel's (yes, indoor!) pool and spa. J had a blast playing with the three of them in the pool. Becca and I had so much fun laughing and getting splashed. We had dinner at Silver Beach Pizza. Another winner!! 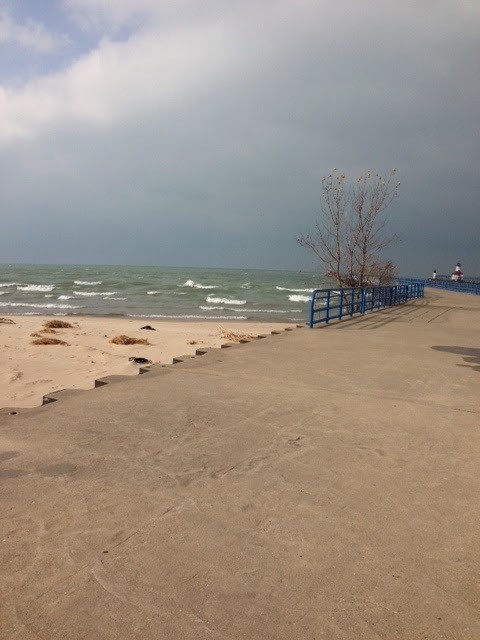 On Monday, J and I had most of the day to ourselves, so we walked around the beaches again and St. Joe. Becca came over mid-afternoon and we skyped into our social worker at IAC for our match meeting. In this meeting, we talked about what kind of contact we/the baby will have with Becca, including emails, birthday invites, photos, and visits. We even talked a little bit about what will happen at the hospital when she gives birth. I think we all agree that our meeting went very well, we are all on the same page, and are so excited to move forward. Can't wait to meet this little guy in March! Eli invited us to his play after our match meeting, and we had so much fun watching him be a cheetah! We went out to one last dinner with Becca and the kids after that. Our plane flew back to Sacramento the next morning at 6:30am, but a huge snowstorm set in, so J and I drove back to Grand Rapids that night around 11:30pm. It took us over three hours to get there and the snow and roads were insane! 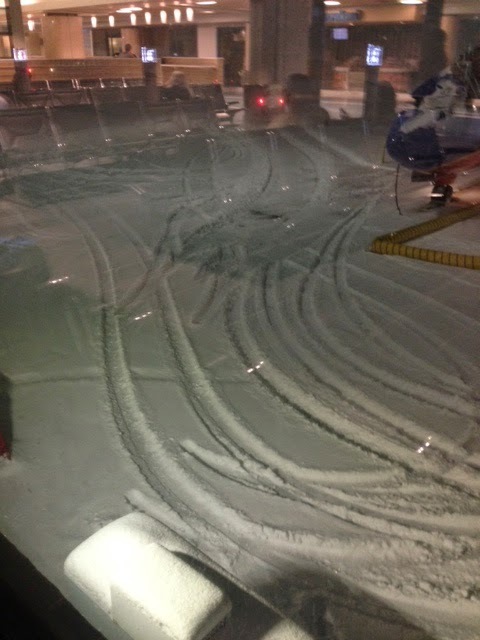 It was a definite white-knuckled drive, but hubby did a great job getting us there safely. We slept a bit in the airport, and luckily, took off and landed right on time. We loved our trip and it went better than we could have imagined. We all get along so well, and it felt like we were meeting an old friend, instead of someone we'd never met. We have a lot in common and we feel very positive about our match. We have so much adoration and respect for Becca. She's raised three smart, caring, and loving children. 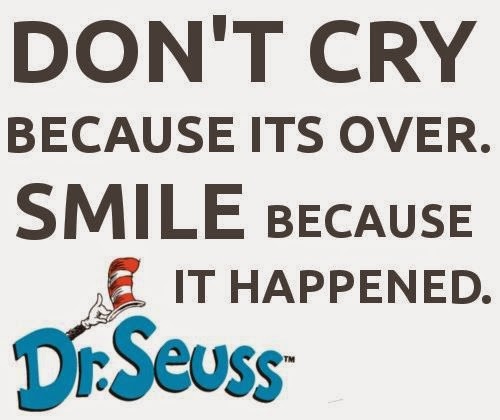 It was honestly, very sad to say good-bye. The good news is that we'll be back in March, and in each others lives forever.